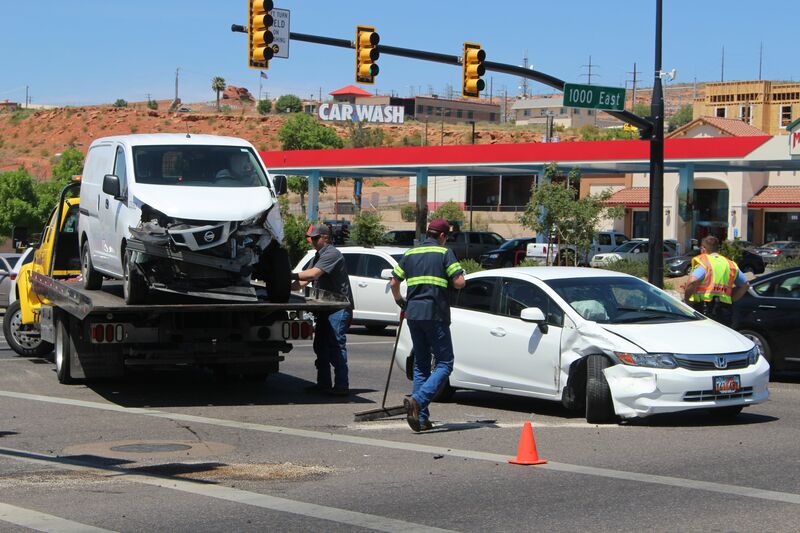 ST. GEORGE — A car and a delivery van got together at the intersection of St. George Boulevard and 1000 East Saturday afternoon just after 1 p.m. – and not in a good way. Traffic stopped in the inside lane, Childs said, and a motorist stopped to give the Civic driver a gap to make the turn. The Civic driver went through the gap but didn’t see the Nissan van coming up and collided with it. The officer said a citation was issued to the driver of the Civic for failure to yield on a left turn. Medical personnel were called to the scene, but no injuries were reported. Both vehicles were damaged and had to be towed from the scene. Traffic on St. George Boulevard was slowed to one lane for about 30 minutes while the wreck was cleaned up. St. George Fire and Gold Cross Ambulance also responded to the scene. Yup, just because someone thinks they are being polite and leaves a gap for a car to squeeze thru doesn’t actually mean it’s safe to make the turn. Sadly, this is stuff that should be common sense, but likely isn’t even taught in driver’s training. While roads can’t be made 100% fool proof, there is plenty of room for improvements in this fast growing, tourist heavy town. Let’s work on that before we buy another motel, build another special park or over spend on a tiny theater. Ok, please, pretty please?